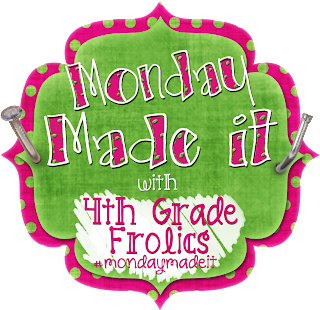 Monday Made-It: Desk Organizer, 150th Product FREEBIE, and Crepes...oh my! Phew! What an AWESOME giveaway weekend! Confession: I love thrift stores. I will literally veer off the road I'm on if I see a sign for one. My hubby says it's mostly junk. My mom doesn't like the smell. But I LOVE the hunt. a super ugly desk organizer! sturdy, functional, and only cost me $2.99! So I decided to ungracefully plop place it gingerly in my cart and work some magic to "pretty it up"
It literally makes goo gone. Any kind of sticky mess disappears. Cheap price tags won't come off clean? Goo Gone to the rescue! I used to be wary of assigning a book report and letting the kiddos choose a book that had a movie - afraid that too many of my students would take the "easy way out" and just watch the movie, missing the fabulous details included in the book. Oftentimes, the books were very different from the movie, so it was easy to tell who had taken the short cut. To ease my conscience and give my students to BOTH read the book AND watch the movie, I created this fun project to test their comparing and contrasting skills. This FREE packet includes 4 graphic organizers to use when comparing and contrasting details from a book and the movie that it inspired. Click on the pictures above or HERE to grab your FREEBIE! In honor of my pal, Christy's, fun linky party, I want to share one of my favorite breakfast recipes, Crepes! They're like pancakes, but are thinner and larger. Growing up in Canada, this is what we called pancakes. I didn't have an "IHOP-style" pancake until I moved to the states! The key is a new dollop of butter between each crepe - but don't let it burn on the pan. I scrape about 1/2 t. of butter into the pan and then immediately pour my crepe batter into the pan. Make sure your frying pan is on medium-high. I wonder if it's you?!?! Note: Tricks of the Trade Thursdays are BACK! New to Tricks of the Trade?